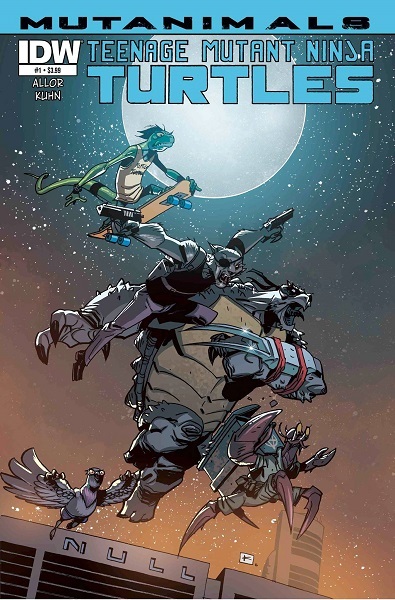 Emerging in the current season of Teenage Mutant Ninja Turtles, the Mighty Mutanimals are a group of mutants formed by reporter Jack Kurtzman (a homage to Jack Kirby, whose birth name was Jacob Kurtzberg) to combat the invading Kraang from Dimension X. The team is the latest in a series of Mutanimals dating back to 1991 created for the Archie Comics’ Ninja Turtles license using mostly supporting characters developed for the toyline and adapted for the animated series. Spinning out of Teenage Mutant Ninja Turtles Adventures #19 into a three-issue miniseries, Man Ray (the model for Ray Fillet in the cartoon and toyline) investigated a meteorite in the ocean off the Amazon where he met the forest’s guardians Jagwar and Dreadmon. The meteorite turned out to be an egg containing the larvae of Maligna, the hive queen of the alien insectoid race of Malignoids seeking to conquer Earth. Meanwhile on the Stump Asteroid, Maligna sent her troops to kill Stump and Sling (operators of Intergalactic Wrestling) for aiding the Ninja Turtles against her previously in “The Final Conflict.” Stump’s employees Leatherhead, Wingnut, and Screwloose fought the foes back and, learning of Earth’s invasion, left to help their Turtle friends. The trio by happenstance touched down in the Amazon whereas the six heroes aligned against the larvae and defeated them as Maligna arrived to lead the invasion herself. As the yet named Mutanimals fought Maligna’s forces, Raphael and his ally Mondo Gecko with former foe the Kid battled the queen directly and forced her to retreat. 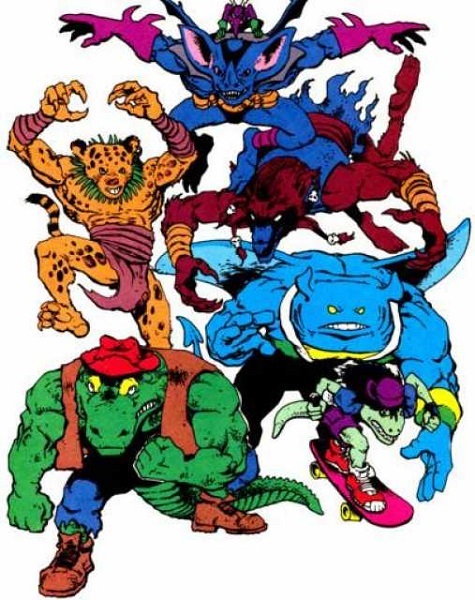 Following the retreat of Maligna, Jagwar, Dreadmon, Man Ray, Leatherhead, Wingnut, and Screwloose decided to remain together in the Amazon as they were joined by Mondo Gecko and the Kid (now going by Kid Terra) in an ongoing comic series. Kid Terra had worked for a demon named Null (who claimed to be the Devil) that made a bargain to sell Earth to Maligna, working various schemes in order to wipe out humanity. Null captured Jagwar’s mother Juntarra and Kid Terra luring the Mutanimals, Splinter and the Teenage Mutant Ninja Turtles, and their ally Ninjara into a battle with the Four Horsemen of the Apocalypse. 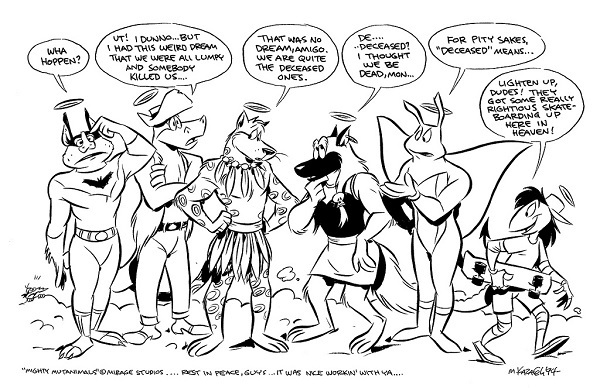 While that storyline unfolded, steps were being taken to adapt the Mighty Mutanimals for television. Ryan Brown and Steve Lavigne, staff members at Mirage Studios who co-created the Mutanimals, wanted to take the success of the comic book miniseries that introduced the heroic group of mutants and transition it into animation under the direction of Mirage. Pitching the series to Fred Wolf of Murakami-Wolf-Swenson (who produced the original Teenage Mutant Ninja Turtles animated series), the concept was rejected leading to the Mutanimals being shopped around until interest was found at Ruby-Spears Productions (the studio behind Wild West C.O.W.-Boys of Moo Mesa, Mega Man, and Skysurfer Strike Force). Estimated for a Fall 1993 premier as a series bible was produced for a thirteen-episode first season, the Mighty Mutanimals saw various model sheets produced for characters, vehicles, and locations. Maligna would emerge as the primary antagonist as the Teenage Mutant Ninja Turtles would have guest-starred in the first four initial episodes while Krang would act as an affiliation of the hive queen. The Mutanimals would have counted among its members Jagwar, Dreadmon, Ray Fillet (nee Man Ray), Leatherhead, Wingnut, Screwloose, Mondo Gecko, and the sole female member Ninjara. Several allies and foes were produced for model sheets (including Scumbug and Wyrm from the original cartoon/toyline) as the team would have gained a mobile volcano island base with several vehicles. Ultimately, the series never took off because it couldn’t attract a toy company to manufacture products based on the show. Playmates, who made the toys for Teenage Mutant Ninja Turtles, would have had to produce the series’ toys but chose against supporting it because many of the characters already had figures due to their past connection to the original series. Several of the concepts from the unproduced series would find their way into the Archie Comics Turtle universe. Ryan Brown would go on to create the Wild West C.O.W.-Boys of Moo Mesa for Ruby-Spears premiering in 1992 with action figures made by Hasbro and comics from Archie (the characters would crossover with the Ninja Turtles several times under Brown’s direction in the Mirage comic series Tales of the TMNT). 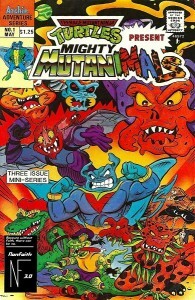 Without the support of an animated series, the Mighty Mutanimals were forced to survive on its sales as a comic book. Following the defeat of Null and the Four Horsemen, the group would tangle with the time traveling cyborg mutant shark Armaggon and the return of Captain Mossback while making friends with Merdude and Slash before their series came to an end. They would return in a back-up story in Teenage Mutant Ninja Turtles Adventures where they are essentially setting up their story in the animated series as they build their volcanic island headquarters Mutani-Isle and their various vehicles with help from future versions of Donatello and Raphael. However, they would be interrupted and murdered in cold blood by gun-toting cyborgs called the Gang of Four (three of which were based on characters from the unproduced cartoon). Null had returned and manipulating the timestream, he hired the cyborgs and had them kill the Mutanimals before they were historically intended to die (perhaps a nod to the animated series never coming to fruition leading to the end of their ongoing comic series). Slash and future Donatello and Raphael would discover the dead bodies of their friends and aligned with Splinter, the present day Turtles, and Ninjara to face Null, the Gang of Four, and Maligna’s forces. In the end, Slash would sacrifice his life to eliminate Maligna and her Malignoids. 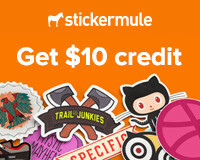 The death of the Mutanimals would leave a lasting impression on fans of the Archie Comics Turtle universe. Ryan Brown would go on to say the group was always intended to be something completely different from the Ninja Turtles and that losing the cartoon and comic book series, he preferred to kill them off in a lasting fashion rather than have them be a secondary team to the Turtles. Slash was also likely killed off because plans were in place to bring that character into the Mutanimals since his introduction in the comics and he no longer served a purpose without the existence of the Mutanimals in the series. In fact, Jagwar and Dreadmon were created with the intention of being killed off and being replaced by Slash and the robot Ninja Turtle Metalhead. Archie would continue to produce Ninja Turtles comics for approximately a year and a half more after the death of the Mutanimals before losing the license. Dean Clarrain and Chris Allan, the creators of Ninjara, were allowed to keep their character following the end of Archie’s license and she would continue to appear in independent comics. The Mutanimals would largely remain dormant for two decades (aside from a cameo in 2009 from Brown in Tales of the TMNT) until emerging in IDW Publishing’s Teenage Mutant Ninja Turtles. In IDW’s version of the Ninja Turtles, the same time the Turtles and Splinter were dropped in spilled mutagen in the sewers, they were discovered by a stray cat that tried to take Raphael. Splinter would save his charge by clawing out one of the cat’s eyes as it ran away, itself exposed to mutagen. The cat would mutate and become Old Hob, never forgetting what Splinter did to him and swearing revenge. Old Hob would become a frequent reoccurring foe of the Turtles until he was believed murdered by Baxter Stockman. 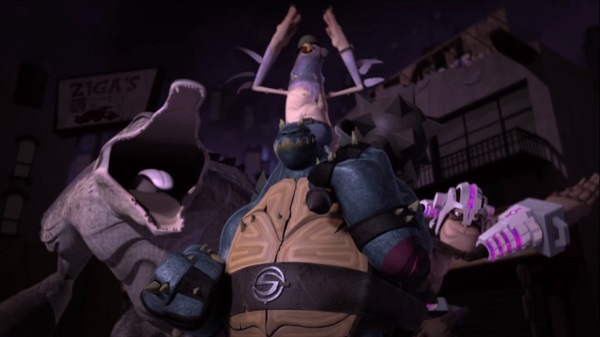 Hob would survive and align with Slash, an experiment of Stockman intended to be used against the Turtles, and decided to build a mutant army against humanity. Employing former StockGen scientist Lindsey Baker, Hob creates Pete (Pigeon), Herman (Hermit Crab), and Mondo Gecko to form the Mutanimals and goes on to free Mutagen Man, Ray (Manta), and Sally Pride (Lioness) from the Null Group to increase his ranks. As alluded to earlier, while the Mutanimals were returning to print, they were also making their premier on television. 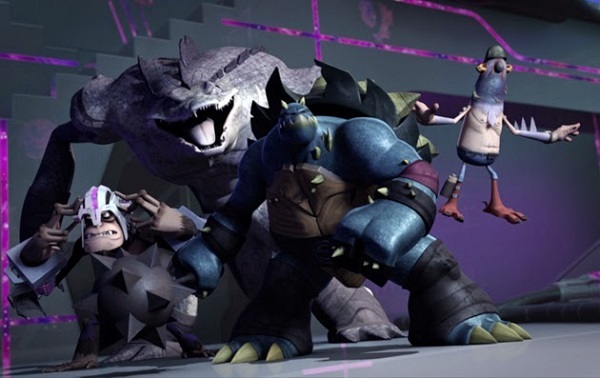 Four months ago on the Teenage Mutant Ninja Turtles animated series on Nickelodeon, the Mighty Mutanimals made their television debut as a group of mutants lead by Slash to combat the Kraang who had conquered New York. Formed by the Turtles’ ally Jack Kurtzman, the group includes Leatherhead, Dr. Tyler Rockwell/Monkey Brains, and Pigeon Pete. Following the expulsion of the Kraang, the Mutanimals then set their sights on taking out the Foot. The ongoing fate of this interpretation of the Mutanimals is largely unknown as eight episodes yet remain to air in the current season and two more seasons have been ordered with twenty episodes each. 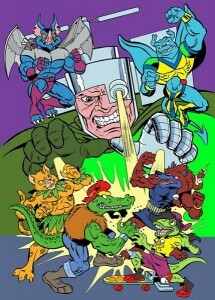 However, the team has a multitude of possibilities before it as mutants like Mutagen Man, Sir Malachi, Muckman, and Mondo Gecko have emerged and the door is open to the likes of Jagwar (or Old Hob), Dreadmon, Man Ray (or Ray Fillet or Ray), Herman, or Sally Pride to appear in the coming seasons (Wingnut was April O’Neil’s father Kirby who has since been made human again). Metalhead was also introduced in the series but has remained simply a head since the middle of the second season when it sacrificed itself to save the Turtles and mutants captured by the Kraang (which included three-quarters of the current Mutanimals).